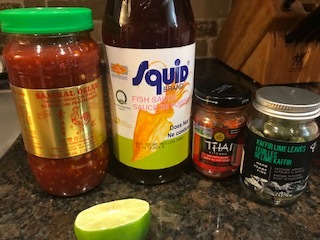 Here are the ingredients you will need for this Thai Green curried chicken – while some are a bit odd they are all easy to find at your local Loblaws. 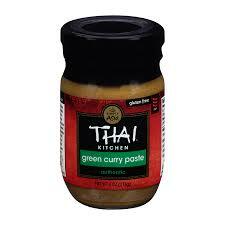 But substitute the thai red for thai green curry paste in this recipe! 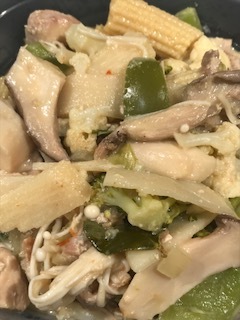 Place 1/2 a can of the coconut milk and half a jar of the Thai green curry paste in the instant pot and mix – Saute for 2 minutes. Add the rest of the coconut milk and whole chicken thighs and set to pressure cook on the highest setting for 4 minutes. Here I took scissors and cut up the chicken into bite sized pieces without removing it from the pot. Add the rest of the ingredients, stir and saute until the veggies are cooked to your desired amount of cooked-ness and you are done. So easy, super fast. Really the hardest part was the chopping of veggies. This time I served it rice-less for myself and with white rice for the hubby.